(1) Seattle Mariners (Western Division champion, 116–46) vs. (3) Cleveland Indians (Central Division champion, 91–71): Mariners win series, 3–2. (2) New York Yankees (Eastern Division champion, 95–65) vs. (4) Oakland Athletics (Wild Card, 102–60): Yankees win series, 3–2. The higher seed (in parentheses) had the home field advantage (Games 1, 2 and 5 at home), which was determined by playing record. Although the team with the best record was normally intended to play the wild card team, the Mariners played the Indians, rather than the wild card Athletics, because the Mariners and Athletics are in the same division. The Seattle Mariners and New York Yankees went on to meet in the AL Championship Series (ALCS). The Yankees became the American League champion, and lost to the National League champion Arizona Diamondbacks in the 2001 World Series. Seattle won the series, 3–2. In Game 1, the Indians held the Mariners scoreless. Bartolo Colón pitched brilliantly, giving up six hits and no runs in eight innings while fanning 10. The highlight for Seattle was the hitting performance of Ichiro Suzuki, who went 3 for 4 in his playoff debut. In the first inning, Seattle made up for Game 1 by scoring four runs in the first inning, headlined by two two-run blasts by Mike Cameron and Edgar Martínez. David Bell helped the cause with an insurance homer in the fifth. Jamie Moyer kept the Indians at bay with one run in six innings, and the trio of Jeff Nelson, Arthur Rhodes, and Kazuhiro Sasaki sealed the deal out of the bullpen. The Mariners drew first blood early on after a walk by John Olerud drove in a run. Seattle left the bases loaded in that inning, but it didn't matter as Cleveland overwhelmed the Mariners by winning 17–2. Starter Aaron Sele was knocked out after giving up four runs in two innings, but his replacement, Paul Abbott, was far worse. In three-plus innings, Abbott surrendered eight runs on nine hits, including three home runs by Juan González, Kenny Lofton, and Jim Thome. On the pitching side for the Indians, CC Sabathia gave up just two runs in six innings, and four more pitchers pitched scoreless ball the rest of the way. Up two games to one in this series, the Indians were ready to pull one of the greatest upsets in sports history. The Mariners, in a do-or-die spot, called on Freddy García to go up against Bartolo Colón in a Game 1 rematch. The Mariners trailed 1–0 going into the seventh inning, but staved off elimination thanks to some clutch hits by David Bell, Ichiro Suzuki, and Mark McLemore, resulting in a three-run seventh inning. Seattle tacked on some insurance runs in the eighth and ninth to tie the series at two games apiece and forced it back to Safeco for Game 5. In a must-win game for both sides, Seattle came out on top and advanced to the ALCS for the third time in their history, and avenged their loss to the Indians in the 1995 ALCS. The difference came in the second inning, when Mark McLemore knocked in two runs on a single. Jamie Moyer got his second win of the series by pitching six innings while giving up only one run. For the Indians, it marked the third time in six seasons they had lost the ALDS, following defeats in 1996 and 1999. Cleveland, a perennial playoff team throughout the late 1990s, would not return to the postseason until 2007. Yankees win series 3–2, becoming the first team in MLB history to win the ALDS after dropping the first two games at home. Roger Clemens, coming off a 20–3 regular season record, struggled in Game 1, lasting four innings while giving up two runs. Johnny Damon singled to lead off the first, stole second, moved to third on a groundout, and scored on Jason Giambi's sacrifice fly. Terrence Long then homered in the fourth. The Yankees got on the board in the fifth when Alfonso Soriano singled with two outs off of Mark Mulder, stole second, and scored on Chuck Knoblauch's single. Sterling Hitchcock, Clemens' replacement, gave up two more runs. Solo home runs to Jason Giambi in the seventh, and Terrence Long's second of the game in the eighth inning, which contributed to Oakland's Game 1 win. Jay Witasick relieved Hitchcock and walked Ramón Hernández. Frank Menechino hit into a forceout, moved to third on Damon's single and scored on Miguel Tejada's sacrifice fly. The Yankees trailed 5–1 in the bottom of the eighth when Bernie Williams singled with one out off of Jim Mecir, then Tino Martinez blasted a two-run home run that brought them within two. Jason Isringhausen, however, sat the Yankees down in order in the bottom of the ninth for Oakland. Andy Pettitte pitched well in Game 2, giving up one run in six innings, but Tim Hudson pitched better, pitching eight shutout innings. Oakland scored first on a Ron Gant homer in the fourth and tacked on an insurance run off Mariano Rivera in the top of the ninth when Johnny Damon tripled with one out and scored on Scott Brosius's error. Jason Isringhausen got the save for the second straight night as the Yankees got the first two runners on base before wasting three opportunities to tie or win it. The Yankees were now in a two games to none hole and the Athletics were just one win away from advancing to the ALCS for the first time since 1992. This series is notable for a defensive play in the seventh inning of Game 3. With Oakland leading the five-game series two games to none, on the verge of completing a sweep, the Yankees took a 1–0 lead into the bottom of the seventh inning behind a strong performance from Mike Mussina and Jorge Posada's home run in the fifth. With two outs and Jeremy Giambi on first base, Terrence Long hit a line drive into the right field corner. With Giambi rounding third base, right fielder Shane Spencer's throw missed both cut-off men. It appeared that Giambi would score easily, tying the game, when the shortstop Derek Jeter, while running across the diamond, reached out, cradled the ball, and shovel passed it to catcher Jorge Posada. Posada tagged Giambi, who attempted to jump over the tag as opposed to sliding around it. ESPN ranks this play as the 45th most memorable moment of the last 25 years. It would be replayed countless times over the following years, most recently as part of filmmaker Ken Burns's documentary The Tenth Inning in late September 2010. After the game, Jeter told the press that the team had been practicing this type of play all year as a result of a similarly botched throw in spring training. According to Jeter, the idea of stationing the shortstop down the first base line on balls hit to deep right field came from Yankee bench coach Don Zimmer, who was a shortstop and second baseman during his playing career; however, he stated that his initial intent was to throw the ball to third to try to get Long, and that his throw home was a reaction play. Zimmer confirmed the origin of the play's design in a conversation with Oakland's third base coach Ron Washington the next day. This single play is often credited with changing the momentum of the series. The Yankees held on to win this game, and then finished off the A's by winning Games 4 and 5 as well. With the momentum of the dramatic Game 3 on their side, the Yankees attacked early, scoring seven runs in the first four innings. Bernie Williams was the offsenive star, knocking in five runs on three hits. Scott Brosius, Jorge Posada, and Alfonso Soriano also drove in runs for New York. Lidle lasted just 3 1⁄3 innings for Oakland, giving up six runs. Orlando Hernández, with little pressure on him considering the big lead his team had given him, pitched 5 2⁄3 innings while giving up only two runs, and Mike Stanton and Ramiro Mendoza sealed the deal out of the bullpen. The Yankees completed their comeback in Game 5, winning 5–3. Alfonso Soriano hit a two-run single in the second inning, and David Justice homered in the sixth. Roger Clemens did not pitch well once again, pitching just 4 1⁄3 innings, but the bullpen pitched well, as Mariano Rivera closed it out to send the Yankees to the ALCS for the fourth straight season. For Oakland, it marked the second straight season they lost the ALDS to the Yankees in five games. "1-1 to Terrence Long. Popped up, third base side, Brosius and Jeter both over. JETER...DID HE GET IT?! DID HE GET IT?! DID HE GET IT?! HE GOT IT! HE GOT IT! They throw to second; the runner tags and he's safe. Or are they saying he didn't get it? Now they're appealing; the first base umpire didn't know if Jeter caught it, had to ask the second base umpire and they said he caught it." Jeter would continue to play in the postseason despite a slight leg injury from the tumble. ↑ "2001 ALDS – Cleveland Indians vs. Seattle Mariners – Game 1". Retrosheet. Retrieved September 13, 2009. 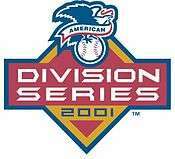 ↑ "2001 ALDS – Cleveland Indians vs. Seattle Mariners – Game 2". Retrosheet. Retrieved September 13, 2009. ↑ "2001 ALDS – Seattle Mariners vs. Cleveland Indians – Game 3". Retrosheet. Retrieved September 13, 2009. ↑ "2001 ALDS – Seattle Mariners vs. Cleveland Indians – Game 4". Retrosheet. Retrieved September 13, 2009. ↑ "2001 ALDS – Cleveland Indians vs. Seattle Mariners – Game 5". Retrosheet. Retrieved September 13, 2009. ↑ "2001 ALDS – Oakland Athletics vs. New York Yankees – Game 1". Retrosheet. Retrieved September 13, 2009. ↑ "2001 ALDS – Oakland Athletics vs. New York Yankees – Game 2". Retrosheet. Retrieved September 13, 2009. ↑ "2001 ALDS – New York Yankees vs. Oakland Athletics – Game 3". Retrosheet. Retrieved September 13, 2009. ↑ "2001 ALDS – New York Yankees vs. Oakland Athletics – Game 4". Retrosheet. Retrieved September 13, 2009. ↑ "2001 ALDS – Oakland Athletics vs. New York Yankees – Game 5". Retrosheet. Retrieved September 13, 2009. ↑ Weinberg, Rick. "45: Jeter's backhand flip rescues Yankees". Retrieved April 6, 2012. ↑ Madden, Bill (2003). Pride of October: What It Was to Be Young and a Yankee. New York: Warner Books. ISBN 0-446-52932-X.